NASA’s Juno spacecraft has once again captured a stunning new look at Jupiter and two of its largest moons. 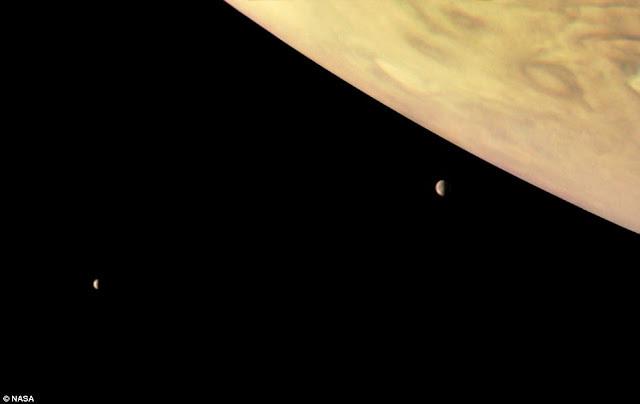 Planet Jupiter is very much known to have dozens of moons orbiting in its vicinity – but, in the new image, the satellites Io and Europa take the spotlight beside the gas giant planet. Europa is thought to be a key target in the search for microbial alien life, as its home to a subsurface ocean that may have the right conditions for habitability. The new view was captured during Juno’s eighth flyby, from about 17,098 miles (27,516 kilometers) from Jupiter’s cloud tops. Dwarfed by the massive planet, the Galilean moon Io can be seen at an altitude of 298,880 miles (481,000 kilometers). Further away, in the left size of the image, Europa can be seen lurking at an altitude of 453,601 miles (730,000 kilometers). Juno captured the stunning new view on Sept 1 at 3:14 p.m. PDT (6:14 p.m. EDT), using the JunoCam imager. Then, citizen scientist Roman Tkachenko processed the raw data. 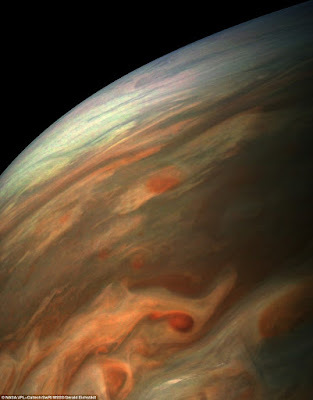 After the raw photos came in, the view was processed by citizen scientist Gerald Eichstädt, revealing the stunning colors and patterns swirling about the gas giant. The photo is just one of several captured on Sept 1, showing various points of interest in incredible detail. A four-photo series released by NASA shows a head-on look at the planet alongside a view of Jupiter tilted upward, revealing the planet's stormy south pole. The first photo offers a look at the center of the planet, even showing a bit of the north and the aurorae on the north pole.The second shows the wide dark belts that contrast with lighter-hued zones, which are arranged at different latitudes and called 'tropical regions.' The interactions of these conflicting cloud and circulation patterns cause turbulence, storms, and wind speeds of 100 m/s. In the third photo, more of the cyclones that live on the planet's south side come into view. By the last, Jupiter's south pole starts to show. The spacecraft whizzed past the gas giant for a total of eight minutes between 6:03 PM and 6:11 PM EDT. At the times the images were taken, Juno's altitude ranged from 7,545 to 14,234 miles (12,143 to 22,908 kilometers) from the tops of the planet's clouds. It flew at latitudes ranging from -28.5406 to -44.4912 degrees. Last month, a stunning new image of Jupiter captured by NASA's Juno spacecraft offered a new perspective on the gas giant, with a view that appears to show the planet flipped on its side.The striking vista features the planet's famed Great Red Spot fading from from view, while the dynamic bands of the southern region come into focus. It was captured using data taken with the JunoCam on July 10, as the Juno spacecraft performed its seventh close flyby of Jupiter. When image was taken, the spacecraft was 10,274 miles from the tops of the clouds of the planet, at a latitude of -36.9 degrees. 'North is to the left of the image, and south is on the right,' NASA explains. The astonishing photo was created by citizen scientists Gerald Eichstädt and Seán Doran - JunoCam's raw images are available for the public to peruse and process. While many of Juno's images have focused on the planet's mysterious giant red spot, its little brother was also recently revealed in incredible detail by the probe. 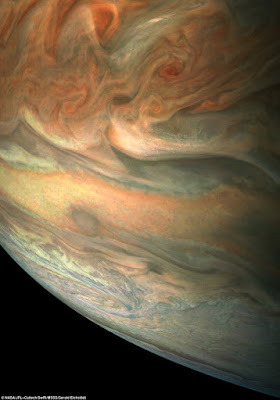 'The success of science collection at Jupiter is a testament to the dedication, creativity and technical abilities of the Nasa-Juno team,' said Rick Nybakken, project manager for Juno from NASA’s Jet Propulsion Laboratory in Pasadena, California.